I like to take stock periodically, to spend a little time reviewing where we are, where we’ve been, and where we are going. This helps me to stay … well, not exactly on track, but at least in the right neighborhood. That neighborhood doesn’t often have tracks, so we will certainly do more than a little wandering, but we’ll wander in a general direction, looking for some specific landmarks. Those landmarks get up and wander around sometimes too, but that just keeps us on our toes. No time for complacency when the landscape is part of the adventure. This doesn’t just keep me going in the right direction, though. 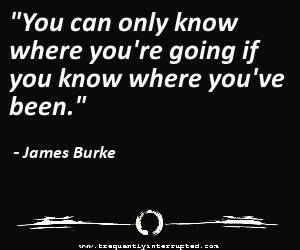 It also helps you to know what direction we’re even going, especially if you are a new reader, and some of you are. You might have gotten here by following a particular idea path and now have no idea what weird turns we have taken. There isn’t a map, per se, but I can draw you a rough sketch. Just understand that there are quite a few Here There Be Dragons or what gamers might think of as Fog Of War spots on that sketch. When you get right down to it, I only have a little more knowledge of our travels than you have, and that, sometimes, only moments before you. It keeps things interesting. First of all, the primary purpose for this intellectual amusement park is what I think of as Zen Mental Health. The name of this place was going to be Finding My Zen before I discovered that name was already taken, so you see how much that idea means to me. Zen is the idea of being here, right here, present and at peace with this moment. It is something I have been studying and practicing for more than twenty years, since I had my breakdown and began my path toward living a full life with mental illness. Which, of course, leads to the parallel purpose, which is the discussion of living a full life with mental illness. While I certainly could have stepped onto the path of Zen without having gone through my past, and many people do walk that path for a variety of reasons, we are each today composed of the cumulative moments of the past. Who I was then directly influences who I am now so, while I may have walked the same path, I would have entered it at a different location, walked at a different pace, and been in a different place today if I had begun from a different past. I have lived with issues that include depression, anxiety, and suicidal ideation for as long as I can remember. I was a nerd who was bullied. I am an unrepentant freak, who usually does a decent job of faking it around “polite society,” but I do occasionally forget. I am ex-military, ex-law enforcement, and a walking mashup of old fashioned ideals with new-fangled ideas. I want everything to be peaceful and loving, and will encourage that in every reasonable way I can, but I know how to be … otherwise, and will always strive to do what I believe to be the right thing at the time. These things have not always played well with each other, but they have learned to live with each other.. They are not who I am, but they are among the pieces that make up my mosaic. They are why I will always spend a significant amount of time highlighting these issues, and any issues that spring from these things. This is my journal that you get to see because it helps me to offer ways and ideas that might help you. It’s a circle, and I hope it remains an interesting circle, but it’s ultimately my circle, or it doesn’t make any sense. I want to help build a better world, and I believe the best way to do that is to start with a better me. If every person focused on being better, the cumulative effect would be a better world, automatically. Building a better me is also where I can have the most direct impact. I can control me; I can’t control you. Nor do I want to. One life is more than enough work for me, thank you. I’ll be happy to be an influence and an example, though. If something I’m doing looks like it would work for you, have at it. Let me know if you have any questions. If we work together, the work gets easier. These are the things I spend the most time with here because, frankly, these are the things I spend the most time with. Period. Anywhere. Like everyone else on the planet, though, I have a variety of interests and priorities that, while not receiving quite as much of my attention, still rank highly in my estimations. I also like variety, though that is something I struggle with. It’s a little too easy for me to get set into a routine, stuck in a rut, even, so mixing in some variety occasionally is borderline mandatory. Bad things happen when I get bored, and no one wants that. Music, books, comic books, science fiction and fantasy, movies, history, science, learning in general. These are just some of my interests, and I do believe that following your interests is part of how you be better. The human mind tends to work better when happy, and we tend to be more happy when we’re entertained. Being human is kind of like being a stew, with all of the ingredients mixed together to achieve the right results. Some ingredients might be more important than others, but they all go together to form the whole, and the same is true about living your life. Anyone who tells you that happiness or entertainment are not important doesn’t understand the stew, or maybe has very bland taste in stew. I like my stew to pop, so I will keep throwing spice at it to keep it from getting dull. I also don’t have time for things I don’t like. Life is short, and I will never manage to read every book I want to read, see every movie I want to see, and experience every song I want to experience. There just isn’t enough time, so I’m not going to take away from the time I have and give it to things that aren’t making my life better. Sometimes you have to address the negative - to defend yourself or to actually fix a problem, for example - but most of the time, it’s far more productive to just move on and focus on the good. It also feels better to be positive than negative. Spend more time promoting what you love than objecting to what you hate, and you’ll usually find that you have more if what you love and the rest just doesn’t matter as much. I believe that rule applies to most of life: the more time you spend on the positive, the less the negative matters. Most of the time - not always, certainly, but most of the time - there are both positive and negative ways to address a situation and most of the time the positive way is actually the better way. I think there is already too much negative in the world, so I try not to add to it. I’ll do what I have to do, always, but I’ll look for the positive, and use it if I can. I will also, of course, make mistakes. We all do. If I were a naturally positive person, none of this would be an issue in the first place, so I have to put in special effort and frequent reminders. It takes work, but I think the work is worth it. It helps to make me better, which helps to make the world better. Round and round and round we go. It’s a long path, but that’s not really an issue. Life isn’t about the destination. The last page is not the book. Enjoy it along the way, and learn as you go. I think that’s pretty much the whole point. If you have been walking with us for a while now, you’ve seen most or possibly even all of this. You’ve seen the twists and turns and I hope you have enjoyed the scenery, detours and all. If you are newly joining us, I hope this sketch helps you to see what is going on. As I said, it’s not really a map, but it’s more than we might have otherwise. It helps, and that’s what we can do for each other. We walk together. We can’t walk for anyone else, but we can all help each other walk. I think we’re doing fairly well. How about you?